S&P/Case-Shiller released the monthly Home Price Indices for December (actually a 3 month average of October, November and December). This includes prices for 20 individual cities and and two composite indices (for 10 cities and 20 cities), plus the Q4 quarterly national house price index. 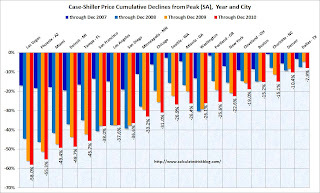 Data through December 2010, released today by Standard & Poor’s for its S&P/Case-Shiller Home Price Indices ... show that the U.S. National Home Price Index declined by 3.9% during the fourth quarter of 2010. The National Index is down 4.1% versus the fourth quarter of 2009, which is the lowest annual growth rate since the third quarter of 2009, when prices were falling at an 8.6% annual rate. 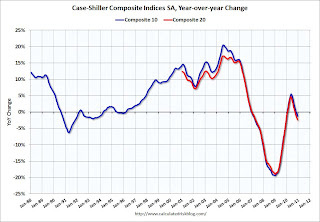 As of December 2010, 18 of the 20 MSAs covered by S&P/Case-Shiller Home Price Indices and both monthly composites were down compared to December 2009. The Composite 10 index is off 31.2% from the peak, and down 0.4% in December(SA). The Composite 10 is still 2.4% above the May 2009 post-bubble bottom. The Composite 20 index is also off 31.2% from the peak, and down 0.4% in December (SA). The Composite 20 is only 0.8% above the May 2009 post-bubble bottom and will probably be at a new post-bubble low in January. The Composite 10 SA is down 1.2% compared to December 2009. The Composite 20 SA is down 2.4% compared to December 2009. 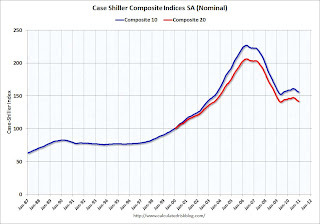 Prices increased (SA) in only 7 of the 20 Case-Shiller cities in December seasonally adjusted. Prices in Las Vegas are off 58% from the peak, and prices in Dallas only off 8% from the peak. Eleven MSAs posted new index level lows in December 2010, since their 2006/2007 peaks. 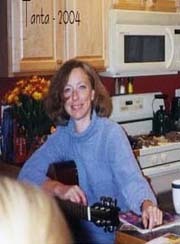 These cities are Atlanta, Charlotte, Chicago, Detroit, Las Vegas, Miami, New York, Phoenix, Portland (OR), Seattle and Tampa. Nine of these cities had also posted lows with November’s report as well. New York and Phoenix are the new entrants to this group with December’s data. Prices are now falling just about everywhere, and more cities are hitting new post-bubble lows. Both composite indices are still slightly above the post-bubble low, but the indexes will probably be at new lows in early 2011.